Vatican City, 3 July 2014 (VIS) – In a press conference held this morning the metropolitan archbishop of Krakow, Cardinal Stanislaw Dziwisz, presented the logo and official prayer for the 31st World Youth Day. Three elements are combined in the symbolism of the logo: the place, the main protagonists , and the theme of the celebration. 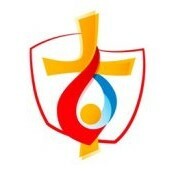 The logo of the 2016 World Youth Day, to be held in Krakow, illustrates the passage from the Gospel according to Matthew, 5.7: “Blessed are the merciful, for they shall obtain mercy”, chosen as the theme of the event. The image is composed of a geographical outline of Poland, in which there is a Cross, symbol of Christ Who is the soul of World Youth Day. The yellow circle marks the position of Krakow on the map of Poland and is also a symbol of youth. The flame of Divine Mercy emerges from the Cross, and its colours recall the image “Jesus, I trust in you”. The colours used in the logo – blue, red and yellow – are the official colours of Krakow and its coat of arms. The logo was designed by Monika Rybczynska, a young woman aged 28 from Ostrzeszow, a small town in the mid-west of Poland, following the canonisation of St. John Paul II. The press conference also included the presentation of the official prayer of World Youth Day 2016, which entrusts humanity and the young to divine mercy, asks the Lord for the grace of a merciful heart, and asks the intercession of the Virgin Mary and St. John Paul II, patron of World Youth Day.